I love carving pumpkins, but it is messy, time consuming, and the carved pumpkins don’t always last that long, especially here in Florida where it is still hot and humid in October. Last week I posted a collection of no-carve pumpkins, and I wanted to try a few. My kids and I have been painting mini pumpkins, which is a lot of fun, but I wanted to try something more creative. 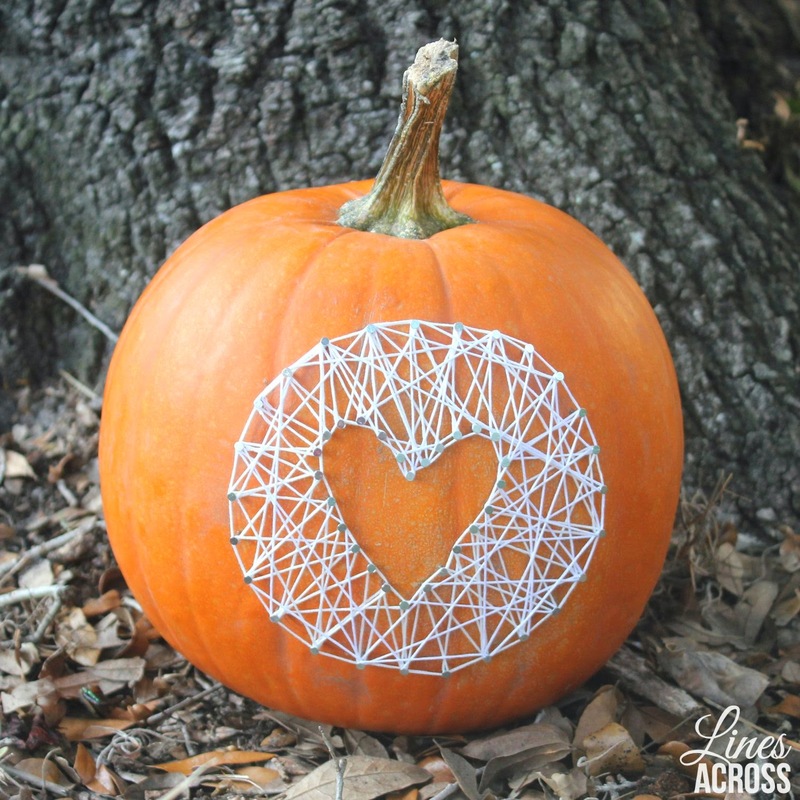 I have seen a lot of creative pumpkin decorating ideas using thumb tacks, and I started wondering if you could use nails the same way and create a string art project. I was worried that the nails wouldn’t stick, and that they would fall out, or that the pumpkins would leak and ooze from the holes. Neither of these things ended out being a problem. 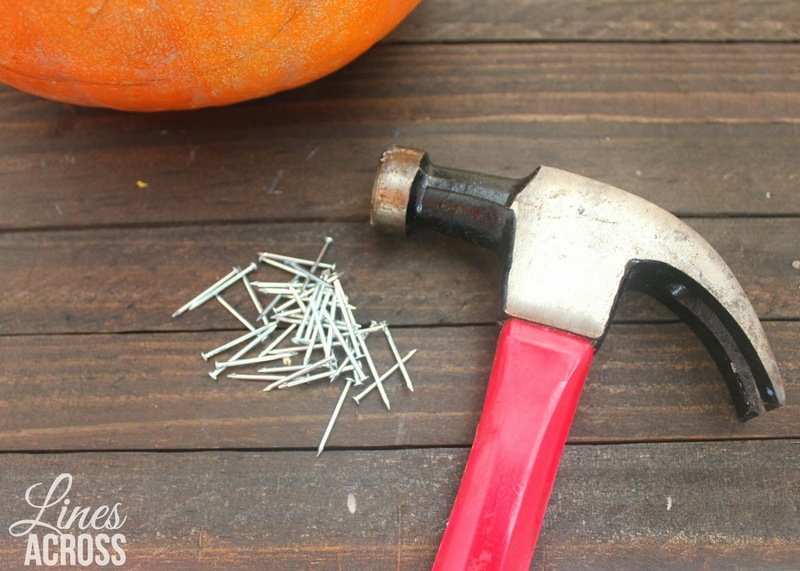 It was so easy (and ridiculously fun) to hammer little nails all around the pumpkin. 1. Prepare your pumpkin. I chose one that was round shaped with a flat side. I used this flat side at the front so that the area with the string art wouldn’t slope too much. You can try a lot of different shapes and textures for different looks. 2. Sketch your design in pencil. 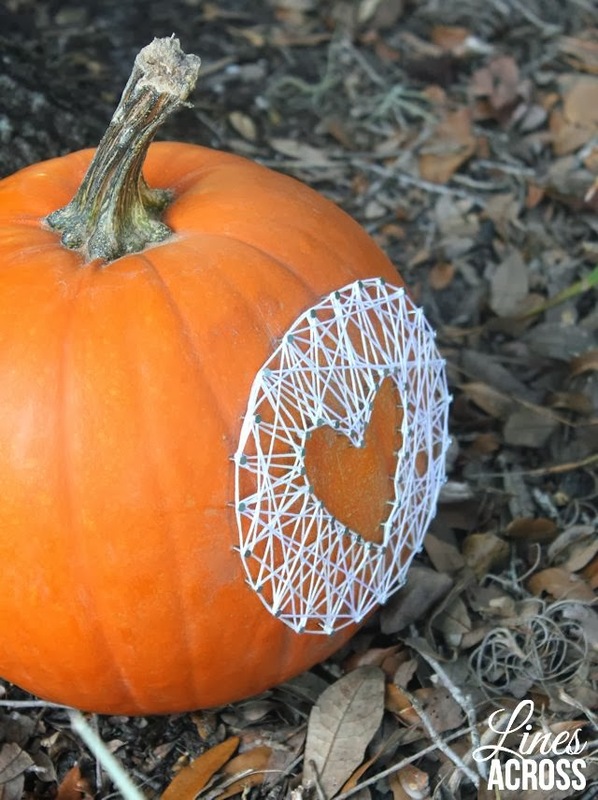 This would also be fun using colorful thread over a spray-painted pumpkin. I’m more of a fall person than a Halloween person, so I went with a simple design. I do like how the white thread looks subtly like a spider web. 3. Start hammering in your nails. Try to keep them evenly spaced, and sticking out of the pumpkin about the same amount. Avoid moving a nail, because it will create a hole that could leak. If you do have to, try filling the hole with some sort of clear glue or nail polish to keep it from leaking. If you are following a pattern like mine, a round circle with a shape created with negative space, I found that it was best to just do two rows of nails. I spaced the outer nails further apart and the inner nails closer together. 4. Tie one end of your embroidery thread around a nail. Cut the extra piece as small as possible. I would also recommend that you secure the knot with some glue. Start wrapping the thread around the nails. You can try to create something of a pattern, or be completely random. You can just barely cover the area, or keep wrapping string until the whole area is almost completely covered. Tie a knot at the other end when you are done, and use glue to secure the knot and hide the little piece of extra string. 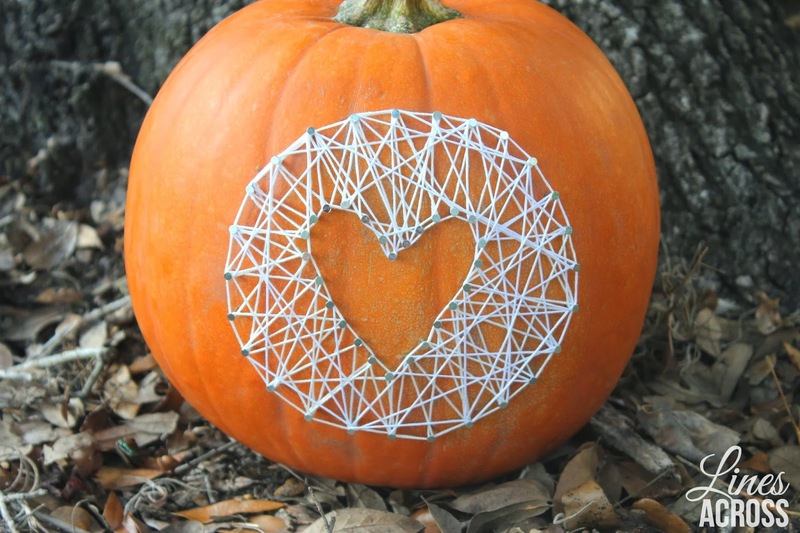 I love how it turned out, and now I want to make more string art pumpkins! 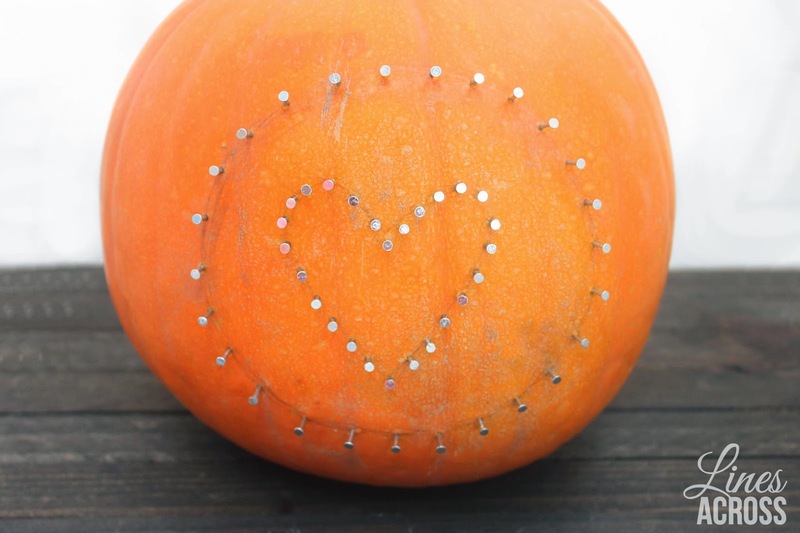 What creative no-carve ways have you used to decorate pumpkins? I LOVE this pumpkin! 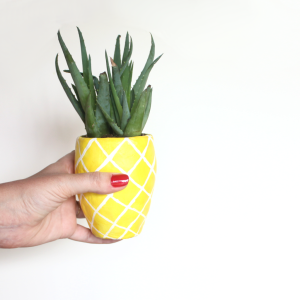 I am getting ready to do a nail art project in my kitchen. I just did a cream felt flower pumpkin… I love doing non.traditional. Thanks for sharing! I love nail art/string art! Your felt flower pumpkin is beautiful! I also love the cream color for fall. 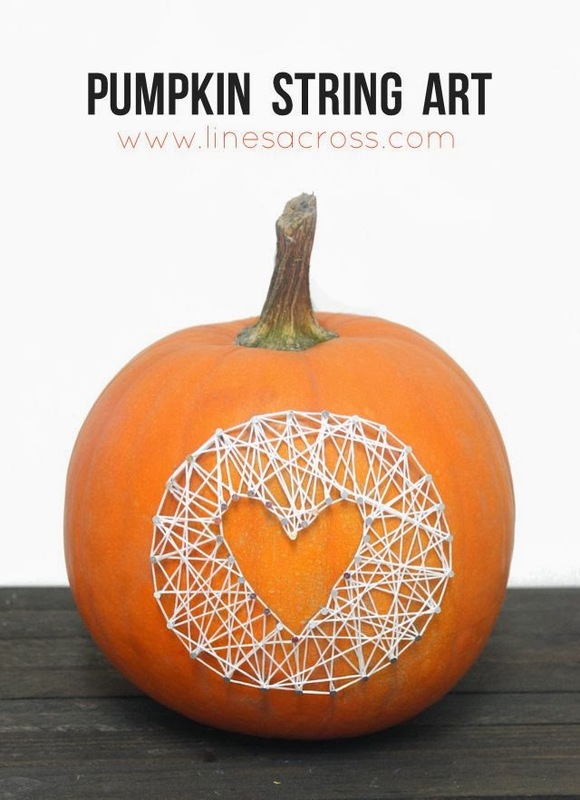 Cool idea to do string art on a pumpkin! Love how it turned out too! Such a cool idea! Love your string art! Super cute and sooo not messy at all!! Love it 🙂 Pinning it to my 'Fall into Autumn' board now, thanks for sharing! This is so cute! I love it! I might have to try it this year. As much as I love carving pumpkins, I always get a rash on my arms from the insides. Thanks for the idea! I love the heart shape! It would be cool to do a Halloween or fall shape too. We'll be featuring your pumpkin over at Someday Crafts tomorrow afternoon, so come on over if you get a minute! Thanks for stopping by and for the feature! LOVE it!! I'm so doing this soon! Oh wow…what an adorable and unique idea! 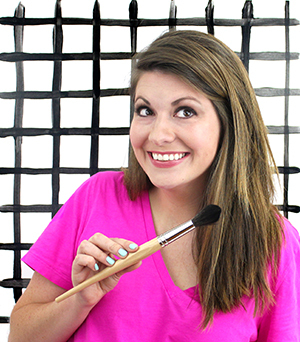 This would be great to link to Create It Thursday #23…it's live now! Hope to see you there! oh my gosh! this is so cute! 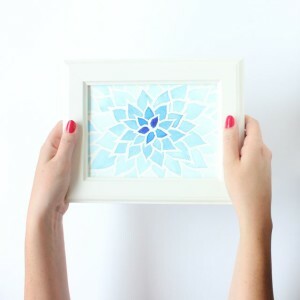 I have had no luck with string art before, but I really want to try this! I LOVE it! It really turned out great!! Soo cute!!! just pinned this! thx for linking up! 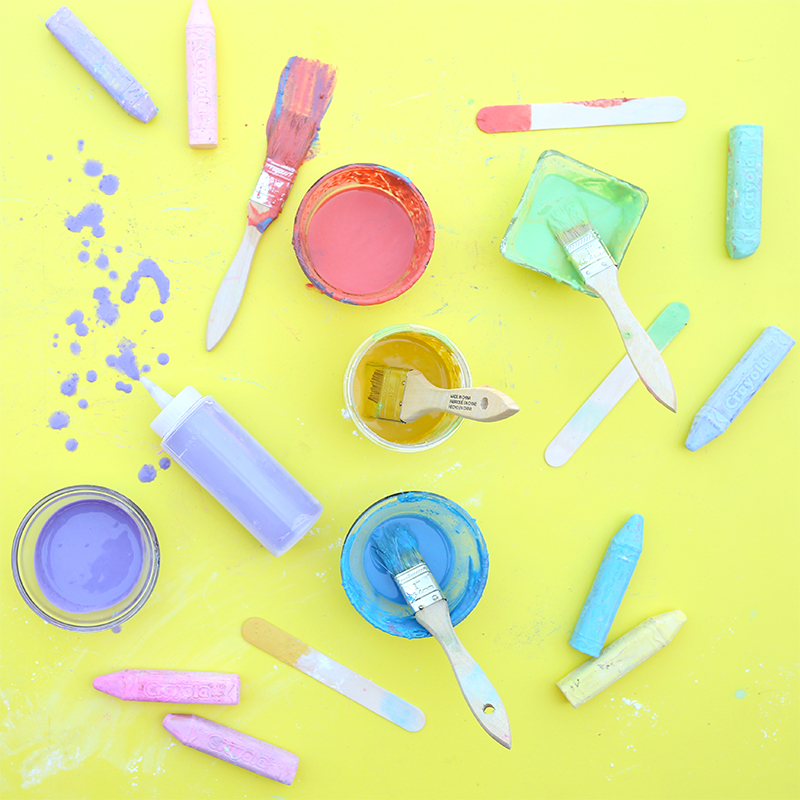 I included your fun idea in my latest article for Parade Magazine! So cute! 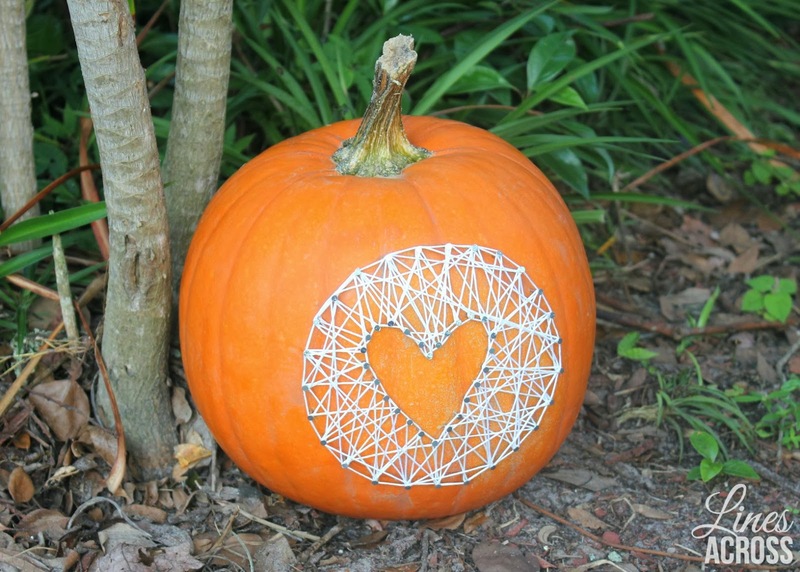 A string art pumpkin?! I'm in love…string art is my new addiction but I never would have thought of this. Awesome idea! Love this Rachel! I don't like to carve pumpkins so this is a great way to decorate! Pinning!